Denise van Kampen of PanAmerican Seed. Cees Bronkhorst and Ronald Lamers of SierteeltSales with the artistic and hand-crafted amaryllis bulbs of their client Amaryllis Unique. Tjerk Vening and Stef Veenhof of Könst Alstroemeria with Sodaxus at the background. The Fleurizon team that was present at the IPM Essen, from left to right: Michael Unger, Frank de Greef, and Dimitris Dimitrou. Wilhelm-Alexander Kordes of Kordes Rosen aned Gert Jensen of Rosa Danica presenting 5 new Kordana varieties. Three of the five varieties are red, because red is an important color for pot roses. Danish nursery Rosa Danica will soon put the first new varieties on the market. Schneider Youngplants presented nicely this year. Peet v. Os, Felicia vd Weiden and Daan Vermeer of Van den Bos Flowerbulbs. They show their concept 'Party' to all hungry visitors of this years IPM. Jean-Yves Coulbault and Christophe Camus of Sicamus presenting their printed pots. They introduced them last year and the demand has been very good. Przemyslaw Procek of Oboya with the new biobased sleeve. Johan v. Eckeveld and Rene Ratterman of Van Nifterik are busy working out the natural look of their products, as we can see from the bamboo rack at the table. The team of Gediflora, the winners of the AIPH Grower of the Year Award. Santiago Brown, the breeder of the Toffee variety of Brown Breeding (the company his father established), together with one of the growers Gonzalo Luzuriaga of BellaRosa and FloralDaily. Santiago Brown now works BallFloraPlant. The preserved varieties of BellaRosa en RoseConnection. This year in Bloom's presentation: Ger Bentvelsen of ABZ Seeds with his wife Anneke. They made sure everyone could enjoy their delicious strawberries. Louise Jepsen of Knud Jepsen next to the Kalanchoe Exotic Orange Meadow, a variety participating in the IPM Essen Novelty award. Kees Verkade of PDI and Dave Bakkenes of Greenpartners talking to Esther van Geest. One of their new colors in the Kalanchoe series. According to Louise, it looks like a colour of a hydrangea. A handsome frog was looking for friends. Otto Hartlieb of Kordes Roses presenting their new red variety Con Amore. It has just been planted in Ukraine and Russia and the reactions so far are very positive. “It has a nive color, nice shape, good and easy production. Russians really like this color”, he says. Team of NIRP International. Copacabana (orange rose on the left) and Hotspot (pink rose on the right) take center stage at their booth. Both varieties are doing well in Kenya and South America. Ted van Dijk of Dümmen Orange with the Green Idols pelargonium series. First, they had two series (Summer Idols en Green), which they now merged together. "We've put the ones with the same growing habits together." Serge Morvan, Tjerk vd Schaaf, Vincent v. Toll and Jeroen Mill, all from Chrysal, showing their renewed product, which is, according to them, 60 percent better than water. Rowen Bruggeling, Brigit Seemann and Johan vd Haak of Decowraps with their Bio-LDPE sleeves. Evelien v. Hooren and Raymond Scheepens of MPS. Carmen Juan-Aracil, Will Zuiderwijk and Mar Parra of Aleia Roses with their new Maxima. This rose was introduced a week before and promises a head of 6 cm. Maya Avni of Hishtil talking with clients. Gerard van Went shows us a golden oldie, the Strong Gold tulip. He also showed a couple of novelties, like their new lilies Fedora, Bacardi and Eldoret. Jeroen v. Dillewijn and Dirk-Jan Lambooy presented amongst other things new Fair Trade flower food and a wide assortiment of sleeves and packaging. David Austin of David Austin Roses. Edwin van den Nieuwendijk and Christian Bremkens of Bremkens Orchids. The Primula hybride Belarina 'Candy Frost' of Kientzler won novelty award in the Spring Bloomer category. Winter-hardy, long-lasting bloomers, attractive flowers. The 'Candy Frost' adds a particularly high-quality variety to the primrose range. The flowers are two-coloured, full and do not open completely. The long pile in spring promises a really long sales period. The 'Candy Frost' is versatile but can also be used solo in combination planting arrangements. It radiates nostalgia and romance and may be the ideal gift for the next Valentine's Day."" Harley, Anders and Rosa Eskelund of Roses Forever. Dave Hoekstra of Koen Pack and some interested visitors from Canada. The scented garden roses of Roses Forever; left: Inger's Rose and Royal Diva on the right. Joop de Boer, Niels Kuiper, Wu Yi, Marco Heijnen and Mark Eijsackers of Floricultura launched their Elastica concept at this year's IPM. Also at the IPM Essen show, Roses Forever presente some new codes. After evaluating the reactions and trial results, breeder Rosa Eskelund will decide with what varieties she will continue. Jeroen v. Weerdenburg with nursery Aphrodite and Matthijs vd Knaap, active in sales with both Aphrodite as well as Plant Creations. Sjaak Oomkens with Matthias Meilland and Damian Cabaret of Meilland. Mario Rigatti and Rina Caccia of Padana. Cristina Uricoechea of Asocolflores and Ximena Franco of Florverde were also visiting the show. Helle Graff and Nethe Stensgaard of Graff. Spotlight at their booth is their new dipladenias in the series; Q-deville. Out of Uganda and Vietnam they can supply growers all over the world. Christiane Appl and Hubert Brandkamp, who, in addition to bedding plants and mums, are now also focusing on hydrangeas. If you're near a chrysanthemum, you're sure Kees Hoogenboom with Biotamax is nearby. Piet Molenaar & Christel vd Helm with Ornamentex counted many visitors to their booth. Gert-Jan Kromhout with Klavervier Plantsales was at the show for his customers, including Hoogendoorn Stephanis & Amarantis. Piet Segers and Loes Beelen of IAA 'International Airfreight Assosiates' visiting the booth of Van den Bos Flowerbulbs. Lisa v. Koningsveld with Francis Schrama showing the new Modiform concept: EcoExpert, an alternative to plastic. Alexander Letkow and Stefan Heyer of Rosen Tantau. Special attention this year is again given to the Bienweide garden rose range. They have this range for around 5 years now and every year, it is expanded with one or two new varieties. Bees has become a hot topic over the years, so the demand has grown too. Thomas Leithe and Ewald Bouwmeister of Weber Verpackungen with the Bloomguard. Recently, they introduced a longer version of this sleeve; 47 cm. Maria Clara, Gonzalo Luzuriaga and Gabriela Meneses of BellaRose and Rose Connection. This Ecuadorian rose farm is present at the IPM Essen for the first time. Jan v Hemet with the Rovero Roll-Air greenhouse. Willburg Projecten, represented by Paul Rademaker, Mark vd Zanden & Adrie v Diemen. They were presenting a new 3D sorting system. The 3D sorting system with Willburg Projecten, sorting products based on the plant's mass. Jorik Homerson, Marinus Schuurbiers & Martin Wigger with Agro de Arend show the Lite-Net, designed especially for lone pines. Frank Warnaar with Total Systems and the miniature TopLoader. The team with Green Products: Matthijs vd Berg, Onno Boeren, Jan Dons and the Green Plugs of course! Bert Spijk & Kees Lagerwerf with KP Holland - shining with the kalachoeum wand. Rene vd Kamp, Gerrard Lentjes, Ed Breedeveld & Thomas Klapdor with Armada / Deconova showed their decorative pot chrysanthemums, mainly popular in China / India. Menno van Es & Helmer van Wezel with their brand More Lips. Emiel van Tongerlo representing Zabo Plant at the IPM and presenting the new Calla Nova series and the Pot Lilies and Roselilies. Rob Braam, Bart Oostven & Albert Houterman with Zonnebloem Henk Braam showed various ferns from their tissue culture. Brothers Joost and Koen Groot with Groot & Groot, specialising in cut flowers and peony plants. Currently there's over 120 species in their assortment. Diane Schrama & Hans Straathof with Straathof Grenethplants, youngplant supplier. Straathof focusses on Europe, Grenethplants on the Middle East & Russia. Erick Juckers and Ard Ammerlaan with Prudac visited the stock market in the middle of the winter. "With the best tomatoes and peppers from all over Germany" Ard laughed. Hylke Kroon, Antoine Groot & Loretta vd Brand presented their award winner - the Begonia Fiona - which won the Fleuroselect Novelty Award 2019. At the end of the first day of the fair, a drink and snack were served at the stand of VLAM while listening to a Belgian band. Arjan Hulshoff with De Ruiter Innovations, Matthijs Plas with Modiform and Jelle Posthumus with United Selections and Huub Snijder of De Ruiter Innovations in the United Innovations booth. Irma Bosman, Christel Reterink & Lyana Odinokaja with Dillewijn Zwapak. Regina Dinkla with Florensis shows the Echinacea Sombrero. Piet Aardse and Walter Gerretzen of Aardse Orchids. This year they presented their bee-friendly products in their new 'BEE Happy' concept. Anton and Thomas of Armada together with the new "Beauty Elegant Pink", available from week 22. Hubert Brandkamp together with their lovely model. Nino Barile, Valentina Damrosia and Andreas Klan present their new webshop that forecasts prices, quantity and availibility untill 8 weeks with a 99 percent guaranty. Maaike Hamer and Dennis Christmann of Stelzner with the Multi 2000. Karel v Braak presented the Toscana Dolce Vita, which you see on the right. Kathy McKay of Schoneveld Breeding flew in from the US especially to show us the Superseries. Robbert and Jaap Jan Uittenbogaard, together with Jos Beelen of JUB Holland. Inge de Clerq of VDW presenting the Plants Bring Life! concept. Father and son, with on the left Wouter David and on the right Jan David. In the spotlights the chrysantemums and ecological strawberry concept, in which every aspect of the production process is optimized in terms of sustainability. Wim Zandwijk together with Anne Marie van Kebol, together in the booth of Kebol. The ladies team of Schneider youngplants: Liesbeth Nijs, Annik Normand and Zsófia Simó. Martin de Vos and Didier Hermans presented a buxus variety resistent to the infamous buxus moth. Rudy Raes together with his daughter Elfie Raes. Van Tuijl Haaften was represented by Frits v. Duijn, Nico den Hertog, Gijsbert v. Tuijl, Gerardus Veenema and Willem Vermeer. One of the novelties was a 125 cm long tray for strawberry production. Stefan Lohuis and Ronald Nijenhuis presented the Green, Greener, Supergreen concept of Kreuwel Plastics. Oliver Dörr and Katja Bruchmann of DH Licht, presenting tests one can and actually should do before changing the lighting in the greenhouse. Victor Eijpen is ready for a ride with the Enova of Horti-innovations. Melvin Geelen of GEELEN, a company ready to install any cultivation floor in the greenhouse. The team of Mprise, here consisting of Isabelle Poessé, Joop de Jong, Arno Hogervorst, Jos van der Helm and Ronald den Uil. Lots of interest for the seeds of Aardam Tropical Seeds. On the photo Anton Spruit, Stef den Brave and on the right Annette and Arthur Spruit. Gerben Anema of Pieter Pikzonen and Hans v. Wagenveld of Tuinplus. Tuinplus is a branch of Pieter Pikzonen focussing on retail. The team of Bunnik Creations, Jan Bier, Kayleigh Ammerlaan and Bas Uithol. Louis Terra, busy presenting the new "Circulair Economy" concept. Edward v. Wonderen of Holland Plug, a young company with a biological solution for the production of young plants. Marco Hartensveld represented NDT International which has a wide product range of indoor and outdoor pottery. Here we see the whole team of both IPP Holland and IPP Poland, Jacek Przybysz, Henk Aufderhaar, Marcin Moron, Ewa Melci-Pander, Bert de Wals and Jos Beverburg. The ladies of the booth from Van Vliet Containers, Ilse Klaassen and Suzanne Fijen. Robert Jan Kolster and Wouter den Hollander from Kolster bv proudly showed everyone their wide range of magical flower and plants. Pey Yin, Xi Chen and Yi Li from Siere Handel represented their tissue culture at the expo. Carolien Klein proudly showed all the visitors their product range of cyclamen. Thijs Veldhuijzen from Plantipp was having a chat with Frans Wenneger and his sons Mick and Niel. Arjan Langedijk from Jan Langedrijk Flowerbulbs sitting with Marco Laan and Rene Pauw. Microflor was represented by Kirsten Verlinden, Siebe Vandecasteele and Bavo Matthijs. They introduced multiple new Hellebores among with their Valentina and the Rose wich are available from now on. Roses Forever received an award for best novelty 2019 in the segment of potroses. Here we have the whole team from Ridder, Boy de Nijs, Rob Veenstra, Jose Carretero, Andrei Chabaline, Daan Schwalbe and Johan van Erven. Jan ten Brink from the Hydrangea Breeders Assosiation was loyal as always being present on the IPM. Swetlana Croonen helped everyone getting the information they needed at the booth of Syngenta. Here we got Bert Baltus from XL Flor together with Hans Hoogendoorn from Hoogendoorn Stephanotis. Stepan Laridon from Hortinno Home showed everyone their new concept of Azaleas to make the youth fall in love with this little plant again. At the booth of FlorAmor we see Petra Brachenier and Christoph Stevens with one of their new Azaleas, but this one is Airborn. Erik vd Voort’s from Amigra was totally in style being in their swimming pool booth, because they are famous for their blue grasses. It was a lot of fun at the Fleuroselect stand with Marleen van Balkom from Syngenta and Leon Vrijland from Pan American Seed together with the ladies from Fleuro Select, Sally van der Horst, Ellen Hazenoot and Ann Jennen. Ramy Zack and James Sword of Tyne Moulds and Machinery. Sustainability is important to this company. For over 10 years, 90 percent of their products are from consumer recycled plastics and at the end of 2018 they had solar panels installed on the roof of their factory, now creating their own electricity. Part of the team of David Austin Roses. New this year at the David Austin booth is the presentation of their cut roses; the David Austin Wedding & Event Roses. Catherine Pilling, Jeremy Watkinson and Nadia Koukil of PCC Labels. They recently decided to produce all their polypropylene tags and labels from 70 percent recycled material. Besides they introduced water resistant paperboard tags and labels, which are also biodegradable and compostable. The reactions from supermarkets are positive as they are moving away from single use plastics, according to Watkinson. Raymond J Evison OBE VMH and Lindsay Reid of The Guernsey Clematis Nursery. New this year is their dwarf climatis variety (on the right). They cover 20 percent of the world market of clematis and alst year, they produced over 2 million clematis. This is how the clematis of The Guernsey Clematis Nursery are shipped out to wholesale growers all over the world. Sjaak Oomkens of Meilland with Arnold Wittkamp of Meilland. Ole Juul Hansen and Tommy Romskov Jensen of Pot Ole ApS. Robert Bijwaard and Karen Magrethe Schnor of Gartneriet PKM, Danish largest campanula growers of Denmark. The large shoe of Elvira Rose filled with the new red pot rose variety of Q-iRose; Tanja. Charlotte Holde of HortiAdvice, a Danish advising company for greenhouse growers and nurseries worldwide. New this year is Hall 6. In this hall, the Danish exhibitors can be found. Birgitte Toustrup Andersen, Torben Moth Madsen and Torben Ryg of Rosa Danica. This year, they presented some new Kordana pot roses, some new scented roses and a new campanula; Ice Blue. It still remains a challenge to show consumers that these flowers are flowering for such a long period. For this reason, Queen decided to present their kalanchoes in a bucket saying that the product flowers for 3 weeks. The kalanchoe in cups creation attracted a lot of attention of the visitors. Edwin vd Nieuwendijk of Bremkes Orchids answered all the questions that one could have about their assortment of orchids. The wedding roses of David Austin being photographed throughout the day. Daniel Girardeau and Britta Humau of Andre Briant. They recently bough a nursery that is specialized in grafting. Now, their range of grafted plants increased. Jacky Cheng, Lynn Tsi and Kido Wu of Sananbio, a Chinese LED and hydroponic modules supplier who is exhibiting at the IPM Essen for the first time. Jacob Andersen, Bodil Clara Johansen and Jorgen Andersen of Gartneriet Thorupland presenting Midnight Ocean; their new campanula which they will be available in small amounts in April. It is an own bred variety that has bigger flowers and is growing very well in the garden insummer time. All of their young and mother plants are based in Vietnam or Turkey. The Crassula 'Buddha's Temple'of Fleurizon. Michael Unger of Fleurizon presenting their ranuculus. Just before the show, the team of Fleurizon celebrated his 10th anniversary at the company. The way Fleurizon delivers the Crassula 'Buddha's Temple'. Fleurizon just started supplying ginger varieties. Tom de Smedt van Hyplast was also visiting the show. Cassy Bright of Plant Patent Agent. Jerome O’Neill of Vista Farms. Suzanne Mulvehill of Miami Tropical Plant. She supplies finished and unfinished plants (hundreds of varieties in more than 8 pot sizes) to garden centers, high end retailers, photographers and so on. The Amore petunias of Danziger. The busy booth of Floragard. This year, this company is celebrating its 100th anniversary. The degradable pot family of Desch Plantpack; Bio, Fibre (paperpulp) and Evo. Plant passport on a Desch pot. Alan Lu and Chloe Zhang of Okidland. Onno Zonneveld of Virtroflora presenting Pink Revolution, a variety that attract bees. Jaap Kras of Floraculture International with Karol Pawlak and his son Konrad Pawlak of Vitroflora and Fleuroselect. Emily Ko of Greenworld, a Taiwanese young plant and tissue culture producer. Last year, they supplied 3 million flasks. De flowers presented by Blütenpracht. Jan Kluthause, Wolfgang Maas and Wim Habets of Veiling Rhein Maas. Every year, this German auction organizes an event and with a theme in which flowers play a central role. Last year, the theme was Mother's Day and this year it is Wedding dreams. Fom 13-03-2019 till 22-03-2019 they will inspire their clients in the Foyer of Veiling Rhein Maas. Peter Oenings, Ina Heuger and Maria Heuger of Heuger. One of the new hellebore varieiteies of Heuger. Ronald Vreugdenhil of Pöppelmann presents the 100% recycled pot series. Christian Madler and Sven Landschoof of Concept Data Systems. Recently, they introduced a new module for German Sales representatives. Anthony Tesselaar of Tesselaar togehter with Perfume Princess; a new cross between Odora x Bholua. Odora is compact and Bholua fragrant. Accroding to Tesselaar, it is a very flexible variety as it thrives on many spots in the garden. Alain Sauve of Sauve Guittet. Tangu Dupas of Florentaise, they supply peatfree substrates. Mohan Choudhery of Black Tulip-Kenya also visited the show. Philip Grimm and Ketty Cancian of Felga Etiketten present their bio labels, made out of mais. Petra Groenewegen and Marjolein Beuzel of Voodstoc. Voodstoc are biodegradable stabbers who also contain fertilizers. Besides, they also present the Growfun pots. They were present at the IPM Essen for the first time. Michael Larsen of Elvira Rose showing the big show filled with the new red Q-iRose Tanja. The roses of Q-iRose are known for their side buds. Besides, this new variety has, according to larsen, a good shelf life, shiny deep green leaves and is easy to grow. The sidebuds of the new Q-iRose Tanja of Elvira Rose. These sidebuds enables the plant to continue flowering. Lars Olsen of Dan Roses showed his new Christmastree and grafted roses. Lemon Grass, a new yellow variety in the Infinity line of Roses Forever. Love forever of Roses Forever. Peter Cox and Frank Counders of Pheno Geno together with Eveline Wild, a famous television chef in Austria. At the exhibition, they presented and baptized several edible roses. During the exhibition, Eveline Wild hosted a demonstration where she showed how to incorperate the edible roses of Pheno Geno into bonbons and chocolate. Eveline Wild during one of the demonstrations. The edible roses of Pheno Geno put on the chocolate. Erwin Verbaeken of Bachnmann. Recently, they became a member of Benefits of Nature. The new Sundaville dipladenia propagated by Padana. Andre Lek and Daniela Navarro of Selecta One presenting the Kiwi, one of their highlights at their cut flower part of the booth. According to Navarro, this variety is doing very well on the clock. Milena Weller of Selecta one presenting Pink Kisses. Ted van Dijk with de GreenGuard kerststerren of Dümmen Orange. The large booth of Dümmen Orange. Peter Bernard represents Jaldety, Cohen and Hishtil in the UK market. Deflet Twiest, Rudolf Sterkel and Tobias van Leuven of Garden Girls. Sterkel is holding the Sunset Trio. The Sunset Trio of Garden Girls. According to Sterkel, with the Sunset, one can prolong the season into spring at it can last into February - March. Wiebke Leuchten and Yusuf Kilic of Blütenpracht. They import flowers from Latin America. The large and busy booth of Landgard. Gill Corless of Sakata next to the dress made out of Sunpatiens. Jan Klussmann of Klussmann Gartenbau talking with clients. This new concept is mainly directed towards children. The plants are deliverd together with collectable cards, taht are supplied together with the plant. Silvia Vige van Lineverde visiting the show. A demonstration of television chef Eveline Wild at Pheno Geno Roses. She made a prosecco of the edible roses of this rose breeder. Peter van de Bekerom of Valyoumax, Gert Canders of Beauty Ladies and kweker Norbert Brüx. Olivier Palussiere of Minier, with 300 ha one of the largest nurseries in France. This year, they presented several new varietiies in their Proven Winners assortiment. Malene Juhl Jensen and Bent Juhl Jensen of Mystery Lady presented their new aster; Nils Norman, named after the famous Danish florist who also baptized this variety. Finn Rasmussen and Jesper Holmgaard of Gasa. Jesper Nielson and Leif Mortensen of Euroflora. Volker Schevel, Raimund Schnecking and Markus Falkenback van Volmary. Schnecking is holding a new herb variety and Falkenback a new strawberry variety. The new herb variety of Volmary; Duft-Rosmarin Saunoa. This is a new dianthus varieteit of Volmary. It is one plant with three colors. The fuchsias of Brandkamp presented in a special way. Joe Roberts, David Kirwa and Jos de Boer of ForemostCo. Bailey Nurseries International also won a prize in the Novelty competition.In the Tub Plants Category, the expert commission decided on the Vitex trifolia 'Purpurea' x Vitex agnus-astus First Editions 'Flip Side' from Bailey Nurseries as the "IPM Innovation 2019". ""This monk's pepper is a particularly grateful shrub, popular with pollinators as it flowers well into autumn. Flip Side' is easy to cultivate, has good branches and is easy to cut. It is a powerful tub plant but also a great bee pasture in a near-natural garden. In the Green House Plant Category, Blechnum brasiliense 'Copper Crisp' from Cultivaris was distinguished as the "IPM Innovation 2019". It is absolutely trendy. Jungle feeling, green plants in all living spaces and green peculiarities. No matter whether in the te"0rrarium, in trendy glass gardens, in the bathroom or quite simply in the living space. The unusual house fern is convincing with its red buds and the firm, extremely ruched, deep-green fronds and forms a small stem over time. Blechnum is a tropical plant and likes warm conditions protected from the direct sun. Aline Andreas of Ciltivaris presents the new plant Ulu. This plant is also known as breadfruit. Every plant sold, 1 euro will be donated to the farmers in the tropiscs. Ulu out of the sleeve. The plant will get taller and will get larger leaves. Besised, the plant is easy to take care for, says Aline Andreas of Cultivaris. Natalia Hamill of Bailey Nurseries. In the spotlight at their booth; Summer Love. It is a new hydrangea introductin that will be available at the retailers in Europe and the US this spring. Ronald van Dijk of Henke Kunstroffe. Currently a new facility is being built for this German pot manufacturer. Procek informs a visitor about their new biobased sleeve. Veronique Roussel and Pascale Mary of Cep. Marenza Marciniak-Ziomek of MZ Forma. The team of Container Centralen. Dominique Placier of SARL les Vergers De Beau Soleil. Claire Barrault of Barrault Horticulture. Adaf Nir of Nir Nursery together with the early flowering white wax flower named Luna. Thomas Büter of Floragard. This year, the company is celebrating its 100th anniversary. Solange Denis, Bart Sambaer, Luka van Evercooren and Rene Denis of Denis-Plants. The new hellebore variety of Denis-Plants; Diego Ice. Francis Paon, Julien Perreve-Genet and Guy de la Martiniere of Fertil. Tom Biondo of Royal Flower with the new mini center pieces. Piet van Kampen of DGI and Warja Abrosimova of Dekker Chrysanten, who was visiting the show. The booth of van Dümmen Orange. Knud Elmer Jørgensen of Hassoe, a Deense packaging company, visisted the show. Axel Hallum of Flroacup presents the Jiffy paper and waterproof pot. Last year, they trialed the pot at 3Danish nurseries and the reactions were very positive. Gartneriet Tvillingaard will supply part of their production in these pots this year. Kristian Kristiansen of Dymak presents their new line of products out of India. Their marketing team of Dymaik and a selection of vendors out of India made this line. Ewoud Goorts of FlorAccess at the exhibition. Olga Lundager of Lundager presents their new ceramics, which are handmade and therefore all unique. The material is stoneware. "Regarding quality, stoneware is just under Porsewline", she says. Steen Juhl Thompsen of Uni-Troll presents a new trolley concept that holds EU ISO standard measurement and EU pallet measurement and can be easily automated. These are two of the main advantages of this new trolley. Remco Hill, Cornee van der Winden and Richard Visser from Forever Plants. Like many others, this grower is not unconcerned when it comes to sustainability, and therefore that part of the range is now also available in biodegradable trays and pots. Brother Bakker of Mondo Verder, presenting the assortment ficus, pachira, ceramics and more. Adwin van Loenen of BM Roses and Loek Ammerlaan of Vilosa. Both growers sell part of the assortment in the brand ‘chique’. Apartus introduced the Sunfinity in Essen. The sunflower, bred by Syngenta, will be exclusively grown and supplied by Apartus in the Netherlands. Air So Pure also had a novelty with the introduction of new sleeves for the spathiphyllum. Mike van der Helm, of world famous grower and importer of bonsai Oriental. Customers who order for 500 euros, get this BBQ. And if you spend even more, other nice presents are thrown in. Anke van Hemert and Suzanne Edelman of Edelcactus. De Edelman family has long grown cacti (currently the fourth generation is in charge), a lucrative business in recent years. Nico Kortekaas, sales manager at FloraHolland, always has something new. That’s mainly because one of his growers, Kwekerij Zeurniet, always has something new. This year it’s the Lova Plant: "Lova, life on lava. The plant that dares to grow on lava"
Nenad Stojadinovic and Jan Peter of Alfa Pro. The software maker put the spotlight on the distributor system, a combination of tablet and wireless printer. Jolanda Nieuwenhuijze of plant nursery Valstar. In winter, the assortment only comprises pot roses, but from this week it will include hydrangeas again. The potted mums will follow soon after. Fabian Noordermeer and Luc van der Sar of Van der Voort. In Essen, the grower presented, among others, the azalea Himalaya, which stands out with its shape and multitude of flowers. Annie Agger and Anni Niber of Garneriet Tvillingaard. This Danish grower will start supplying part of their production in the new Jiffy pots. The team of Sjaak van Schie, one of the bigger players in the world of hydrangeas. Thomas Offer Madsen of BotaniqLab. At their booth, the new spring-summer collection 'Earth Connection' took a central stage. 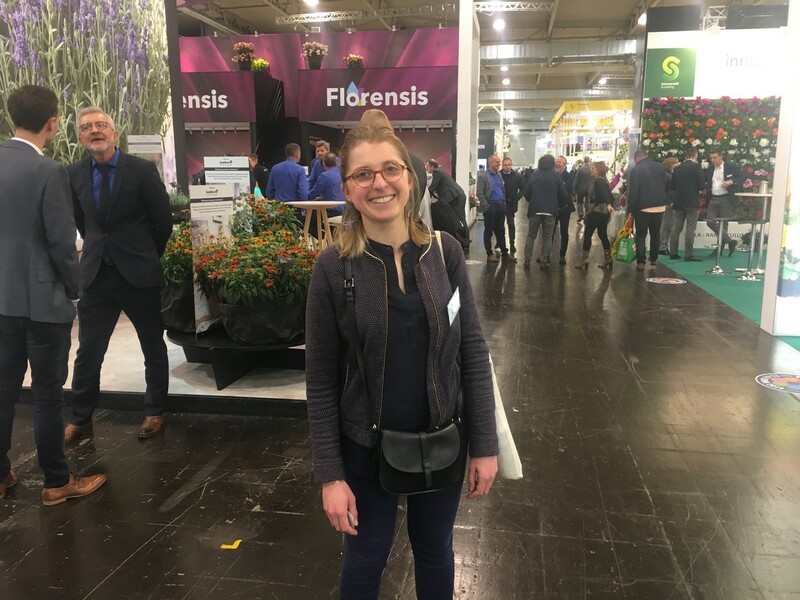 Nouschka van der Burg of gerbera grower LG Flowers, with Nico Kiep of chrysanthemum grower Kiep Flowers, two of the dozens of growers exhibiting in Essen under the FloraHolland umbrella. Manfred Robert of Liriope Factory. Over the years, he has seen the demand for Liriope growing. Kwekerij Wouters, represented by Pascal and Matthias. Marco Hendriks and Matthieu van Koppen of Opti-flor, which distinguishes itself in orchids with stylish creations. Andreas Pellens of Pellens Hortensien presents the roots of their hydrangeas with this transperant pot. The transparent pot that Pellens Hortensien used to show the roots of their hydrangeas. According to Anders, the roots are developing much better when they used wood on top of the container. Besides it also saved water. "2018 was a much hotter summer compared to 2017, but we used the same amount of water", he says. Levoplant presented a new sustainable packaging for transport: a sleeve made of paper rather than plastic. This way, the flowers are well protected during transport, and the sleeve only has to be cut loose. Stolk Orchids also discovered the paper transport cover. The Your Natural Orchids brand is thus developed further step by step, says Chris Oosterom. Marcel Moeskops of GreenBalanz. This orchid grower manages sustainable production in a novel way, growing the plants organically. Downstairs, there were flower shows almost continually. Florists, both well-known names and students, created beautiful pieces on a rotating stage, with pack stands. In addition to floral pieces, they also tried to show what else you can use flowers for. Nieuwkoop presented a new brand to the market: Baq. The brand, Danny Gerritsen and colleagues explained, include the plant containers imported by Nieuwkoop. Shiochi Oshio of Floralcrest Japan also visited the show all the way from Tokyo. Nice to know: the Surfinia, an MNP variety, celebrates its thirtieth birthday. The first license holders were presented with a golden spade. Bill Kempes, amaryllis agent, and Fred Breekhuizen of Sure Plants, together in the stand of Gebr. van Velden (for whom Fred does some of the sales) and of AgroFloralPeru, active in the bulb trade with Europe. One of the additions to the FotoCCar assortment, a double FotoCCar. In front of it a multilayer CC. Handy for taking pictures of and auctioning mixed trolleys. If you see a large Christmas tree on the village or city square, chances are it comes from the tree nursery of Pierre Demesmaeker. He also sells the FotoCCar’s, which he develops further each year. Richard van der Berg, Kayleig Ammerlaan, Jeannette Rosenboom and Jurrien de Vries, who together presented the plants and added value of Bunnik Plants and Bunnik Creations. Romeo Sommers (on the right) talking with visitors. Soerinder Somai and Marco Stolze present ClockOnline, with which growers can auction their products from the nursery, in real time, on their own PC or mobile phone, or in the app or browser. It looks promising and the interest is there, the gentlemen explain. Richard Jeucken and Leon Huver of Garden Plant. Jorn Hansen of Jackpot, a danish pot manufacturer, also visited the show. Stefan Schyth and Christian Jacobsen of Eurotrend. Part of the team of JMP Flowers, a large phalaenopsis grower in Poland. Dolf Verbakel of Moerings, which is well-known for its aquatic plants. Gert Pezij of GP Plants, specializing in the production of starting material, mainly for Heuchera and Echinacea. Jaap-Jan Uittenbogaard of JUB Holland is proud of the Planet Proof certificate. The company also presented various new packaging solutions / gift wrappings, and the spotlight was also on the organic flower bulbs the company gets from third parties. The gentlemen of Evanthia, always in for a joke, but of course also for a wide range of cut flowers, potted and bedding plants and tropical plants. The brassicas have been doing well in recent years. Thon Groenendijk and Simone Heilbink of All Plant. In the green plants, there’s plenty of business, which All Plant knows very well. The expansion, opened about two years ago, is already becoming on the small side. Sirekit Mol, Stephan Faisst, Bas van der Kraan and on the left a new face at Beekenkamp, Marc van Heijningen. In the background, the Dreams collection, under which Beekenkamp markets the begonia varieties. There was also a host of new introductions. Stefan Laridon of Hortinno. The Flemish azalea breeder managed to cross a Japonica with the azalea Evergreen, resulting in a variety that gives far more flowers than a traditional azalea, providing a guaranteed 50 days of flowering. AIKO and TOSHI are two brands in the Belgian azalea business, marketed with posters like these. Kamil Wozniak of Tek, a Polish company specializing in the production of labels and packets for seeds. An addition to the product range is the so-called Grass paper, paper that’s comprised of 50 percent grass. Jacco Huibers, Nicole van Langen and Rick Mulder, the sales team of Amigo Plant – they could use a bit more help around the nursery! Rick Nannes of Latiflora, Nicole van Langen of Amigo Plant and Menno van der Straten of Succulents Unlimited are a good tandem. The former produces starting material, the latter takes care of trade, and Nicole makes beautiful plants out of it. But Gediflora weren’t the only ones! Jolu Plant, Luc Pieters’ company, is a known player in Belgium and abroad when it comes to garden chrysanthemums. Aksel de Lasson of Aqua-Hort, which kills fungi and bacteria in water through elecrotlysis. Jasper Zuidgeest of DynaPlant, calling consumers’ attention to plants with the #sohappycalla brand. IPM Essen will organize an ornamental trade show in Mexico in September, it was announced recently. We’ll report on the partnership between Ornamental Plants & Flowers México (OPF) and IPM as more information becomes available. Director & breeder Peter Cox, researcher Biljana Božanićm and former ice cream making world champion Theo Clevers in the Pheno Geno stand. Theo made ice cream with the edible roses, a feat that he’ll hopefully repeat! Wouter de Vries, director Parfum Flower Company, with Jo Bird of David Austin. Jo is holding the Juliet rose, David Austin’s most successful product, released in the early 1990s and still going strong in the bridal rose assortment. Raimund Schnecking of Volmary. They grow mother plants of the herb range organically, and can also prove it with a certificate now. And that, Raimund knows, hardly anyone can do. Ton de Bresser of Selecta One, who surprised the IPM’s novelty committe with the Christmas Mouse - the unusual poinsettia with round instead of pointed leaves, grabbing the top award in the category flowering indoor plants. Also new at the show as the introduction of Autostix, an innovative strip to transport young plants and then to simply pot them automatically. ROCS, which stands for Rooted Cutting Solutions. The trade show tigers Cees Bronkhorst and Ronald Lamers of SierteeltSales, who represent a large number of growers and thus can offer a wide range of products. Dirk Hogervorst, director of Spanish-Dutch rose grower Aleia Roses. At the show, the grower presented the new Maxima brand. Antonia Feindura talking with a visitor. Maria Castellani of Flora Toscana. The team of Flora Toscana. Lionel Chauvin and Karl Storf of Chauvin present the French Bolero, a new hydrangea bred by several French breeders. Lionel Chauvin, Didier Boos of HW and Karl Stof of Chauvin present the French Bolero, a new hydrangea bred by several French breeders. Bernd Steiniger of Hortensien Steiniger. New in this hall is Zillmer; Reinhard Meier-Zillmer and Beate Zillmer. The preserved roses of Verdissimo. On the picture: Alfonso Casamitjana. Jürgen Gerdvordermark of Kötterheinrich hortensienkulturen. This year, at their booth, they put the focus on how their products are being delivered. A lot of meeting going on in the booth of Intermarkt Thielen. Jurrasic World; a new sales concept of Landgard. Sisters Iris and Jasmine Hassinger of Hassinger Orchideen presenting a new concept; Cocoon. These are botanical orchids, grown like in natur, on a tree. Due to the glass they are in, thy have their opwn microclimate. Kees Eveleens and Thomas Eveleens of Bocaise Hydrangea propogation together with two growers. The team of van Gebr. Brill Substrate. John Gaydos og Proven Winners. Brill can supply substrates in a mix. Here a mix with all companents. Ralf Ostkotte of Osko presents his new pot. The new pot of Osko. Herbert von Danwitz of Danwitz. "By growers go green" Nieuw dit jaar zijn de mini's. De Begonia Maculata bijvoorbeeld that Jesper Madsen is holding was introduces as a 12cm last year and they now also have a 6cm version. Christian Schultheis and Rob Wijnhoven of Roparu Rozen in the booth of NIRP International. Also at bij Georges Delbard cut roses were on display. Alexander Bock and Montserrat Josa of Diem Hibiscus. New this year is the white hibiscus variety Pure Emotion (see hibiscus on the left). Special about this flower is that it remains open for 3-4 days. Cook Theo Clevers makes icecream of the edible roses of Pheno Geno. The edible roses of Pheno Geno Rosen. The team of Easycare presents their new concept; greenhome. The plants in this concept need a little bit more care than the products in the Easycare line, which last minimally 45 days without water or light. A variety in the Greenhome concept of Easycare. 4 themes were presented at easycare; Nature, Discover, Emotion en Icons. Jacques Ferare, Layci Gragnani and Bradd Yoder of Star Plants & Roses. Phillip Becker (left) and Matthias Rohde (right) together with growers Anne Malaka and Philippe Eyraud of Eyraud Productions. Okan Tüysüz of Becker talking with a visitor. The Combi 5000 of Step Systems. Isolde Proelss, Marjan Karlovic and Anastasia Konarek of Step Systems presenting the Combi500 die PH, EC, salt, soil temperature, moisture. The large hanging basket of PanAmerican Seed. Visitors making selfies with Smither-Oasis. Asli Sazolister of CYF. They will organize Eurasia Plant Fair / Flower Show in Turkey that will take place from November 28-3. Giancarlo Bercigli of Agri Vivai presenting 3 different types of biomulching for pots. The three different types of biomulching of Agri Vivai. James Andreade of Valleflor. 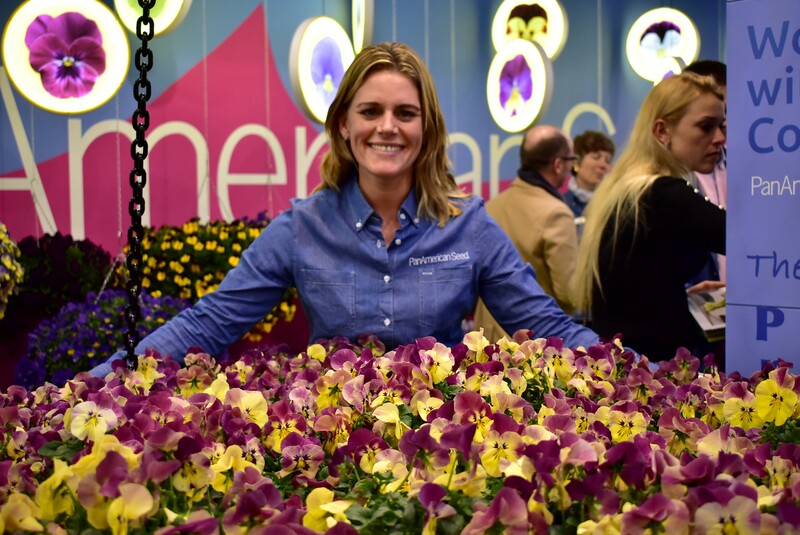 It is the first time at the IPM Essen for this Ecuadorian flower grower. Cook Theo Clevers and grower Willianne Sluiter, from Incredible Roses baptizing the rose named The Clevers. Jos Verboom of Kwekerij Verboom grows mainly Hellebore and supplies them to several countries in Europe. Germany is an important country to this company. The team of Terra Nova and Danziger at the booth of Danziger. 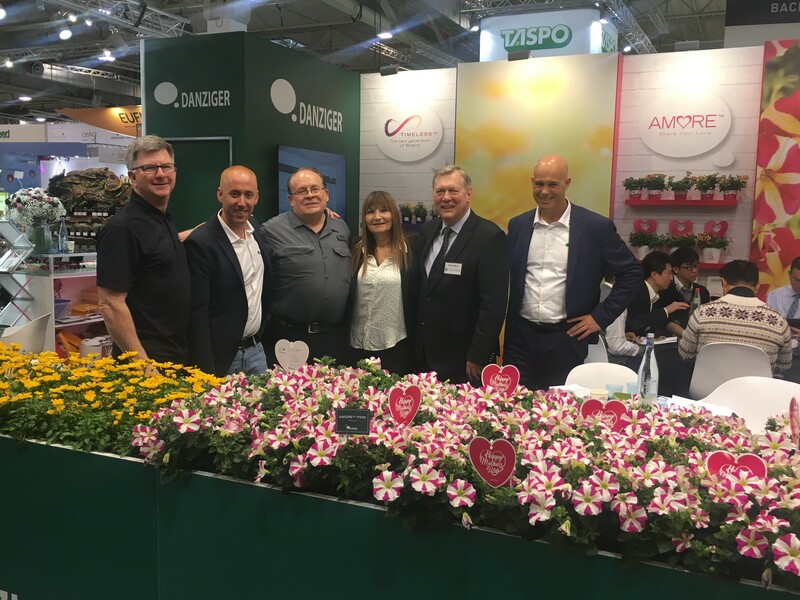 As a part of the new agreement Danziger will become Terra Nova Nurseries’ licensee and producer of vegetative cuttings for Europe, Asia and Africa. Tamara Risken and Jim Berry of J. Berry. Cecile Duval of Les pépinières de France was visiting the show.